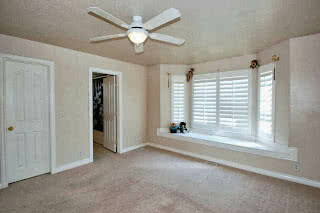 This is what our master bedroom looked like when we moved in. We started by tearing out all of the carpet. The carpet was about 20 years old and definitely needed to be upgraded! 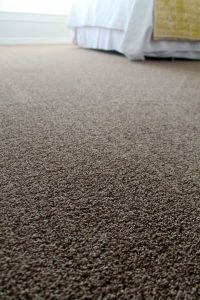 You can read more about the carpet we chose HERE. 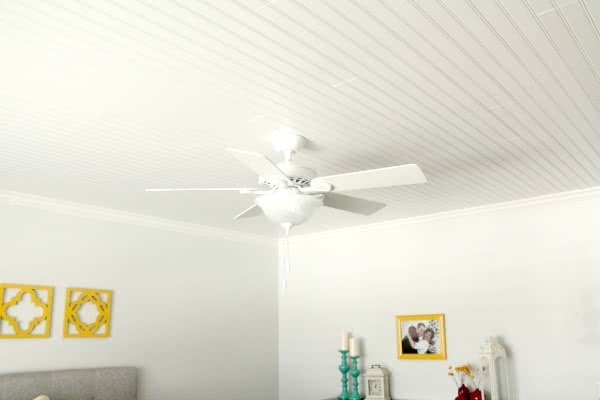 After we were done painting, we installed Armstrong WoodHaven Paintable Beadboard Planks and replaced the ceiling fan. The ceiling was so easy to install that we were able to do it ourselves! I love how bright and fresh the room looks with our new ceiling! You can read more about it HERE and watch a video of how we installed it! 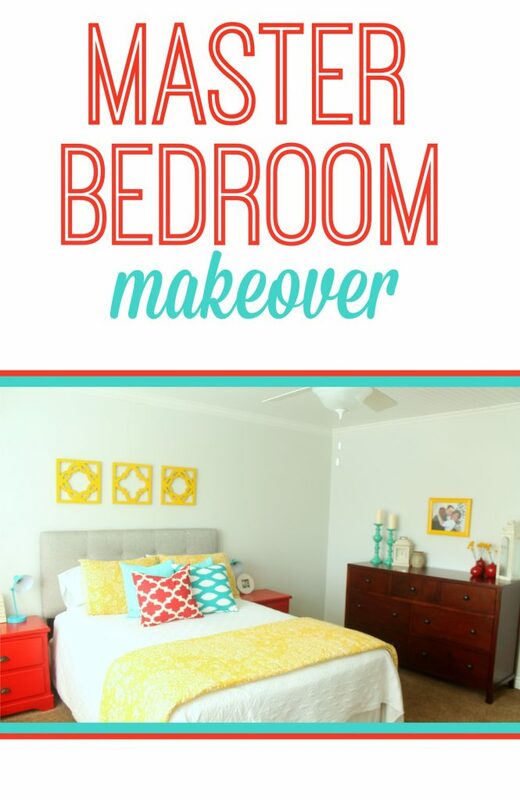 Our master bedroom makeover actually all began with a new headboard! Haha! 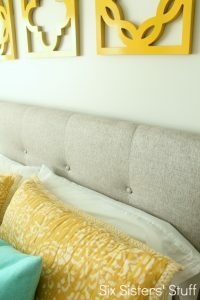 This darling headboard is from Wayfair! 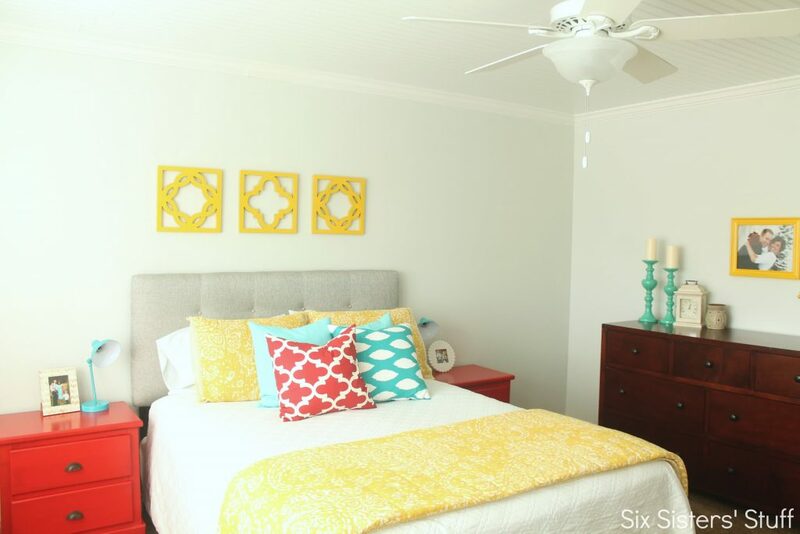 Wayfair had such a huge selection of headboards, that it was so hard to narrow it down, but I loved the color and affordable price of this one. Don’t you love those tufts?! Our previous headboard was really dark wood and pretty bulky. We love how simple and stylish our new Wayfair headboard is! 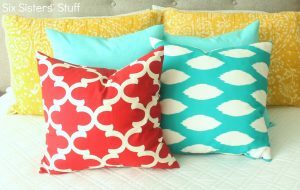 Our darling throw pillows are from My Pillow Studio! 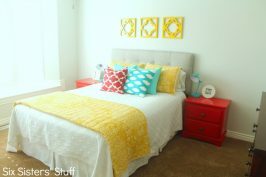 I love the color these pillows add to the room! 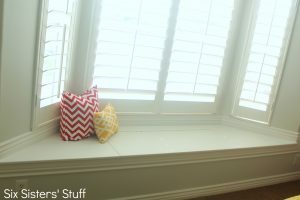 My Pillow Studio makes affordable handmade pillows, pillow covers and custom made curtains! I refinished the nightstands myself! I got the set of nightstands for $50! 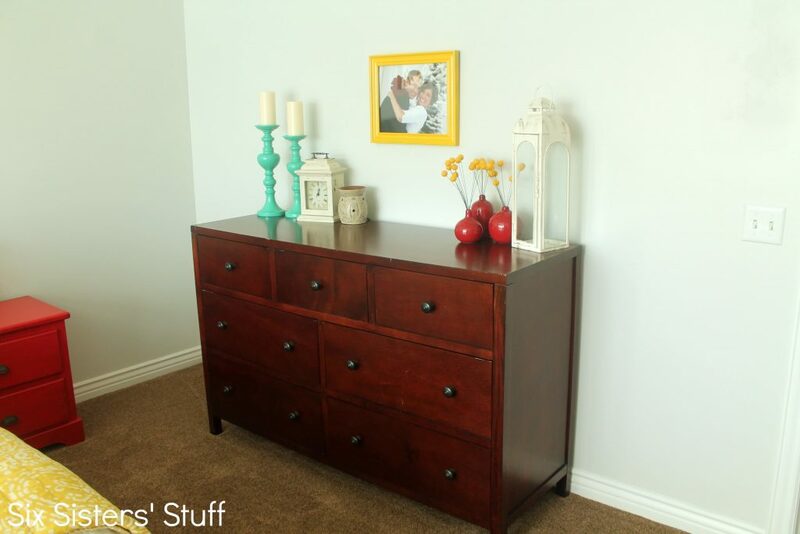 You can read about how to refinish laminate furniture HERE. The yellow wall hangings are from Target. You can find them HERE and HERE. They come in a gray wood color, but I just refinished them using glossy, yellow spray paint. 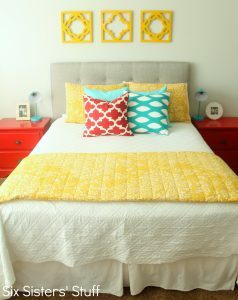 The teal lamps, frames and yellow quilt and shams are also from Target. They no longer sell the quilt online, but you can get the comforter and shams HERE. I got the white sheets and quilt on eBay. The quilt was only $40! We already owned the dresser. I was considering refinishing it, but I thought it added a little contrast to the room! I found the teal candle holders at Ross. They were a steal! I spray painted an old frame we had to match the wall hangings above the bed. I got the clock and the lantern from Z Gallerie a few years ago. I found the cute set of vases from Crate & Barrel for just $20! I found the yellow billy ball flowers on Etsy. So there you have it! 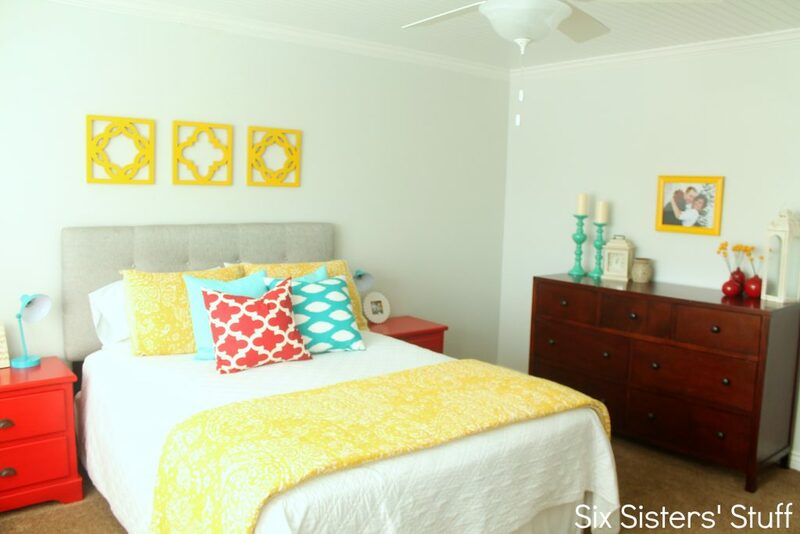 We love how much brighter our master bedroom is now!